Defending champion Ahli Shabab Dubai (D1) added to their roster 33-year old American (has also Iraqi passport) forward Sammy Monroe (198-85, college: Newberry). 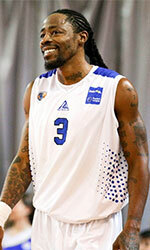 He played recently at Homentmen in Lebanese LBL league. He helped them to make it to the Supercup final. The last season Monroe played at Al Gharafa in D1 where in 18 games he had very impressive stats: 20.3ppg, 10.1rpg, 5.8apg (top 4) and 1.8spg. He contributed to his team winning the regular season and make it to the semifinals. A very spectacular season in his career as he was named to Asia-Basket.com All-Qatar D1 2nd Team, All-Imports Team and League Player of the Week. In 2007 Monroe was drafted by Sioux Falls Skyforce (D-League) in ninth round (118th overall). He attended Newberry College (NCAA Div.II) and it is his twelfth (!!!) season in pro basketball. The list of the past achievements is quite long as among others Monroe's team won Qatari Cup in 2015 and 2017. He played at the Arab Club Championships Semifinals last year. Monroe is quite experienced player. His career allowed him to visit four different continents, while he played in nine different countries. Monroe tasted the life as pro basketball player in Europe, Asia, Latin America and of course North America. He has played previously professionally also in Malaysia, Mexico (Halcones UV Xalapa, Mineros de Caborca and Potros), Philippines, Saudi Arabia (Al Nasr), Spain (Tenerife), UAE, Uruguay (Malvin) and PBL (Rochester R.). Monroe is a former Eurobasket Summer League player, which is considered top summer league for players who want to play basketball overseas. On Monroe: A big guard with skills who can also play the small forward position. He is a smooth and gifted scorer who creates well off the dribble and can knock down the perimeter shot. He has experience playing in Mexico and was one of the top scorers in the Philippines in 2010. During the ESL he showed his athleticism and he creative skills as a scorer either getting to the basket or knocking down jump shots.